Cyclists that are looking for a convenient way to carry and read their smartphone screen whilst riding may be interested in a new multipurpose bike light and smartphone bike holder called the Besee which has been created by Jay Carty based in the UK. The Besee provides a variety of useful functions including a power bank, bike light, smartphone holder and more, watch the video below to learn more from its creator who explains more about his inspiration, design and functions. In the process of developing a number of new smart cycling gadgets, we created the BESEE Bike Light, a truly multi-feature smart light that is designed to increase the levels of safety and comfort to cyclists and other outdoors enthusiasts. The BESEE Bike Light can act as a normal bike light – but its features are way beyond normal: they’re quite extraordinary. With a built-in power bank, the BESEE Bike Light allows you to keep your smartphone (or other device) charged while cycling, without running the risk of having the battery dying off. With its safe universal smartphone holder, this will allow you to take your smartphone on your bike right in front of you, using it as a simple, efficient and convenient cycling app or navigation system. 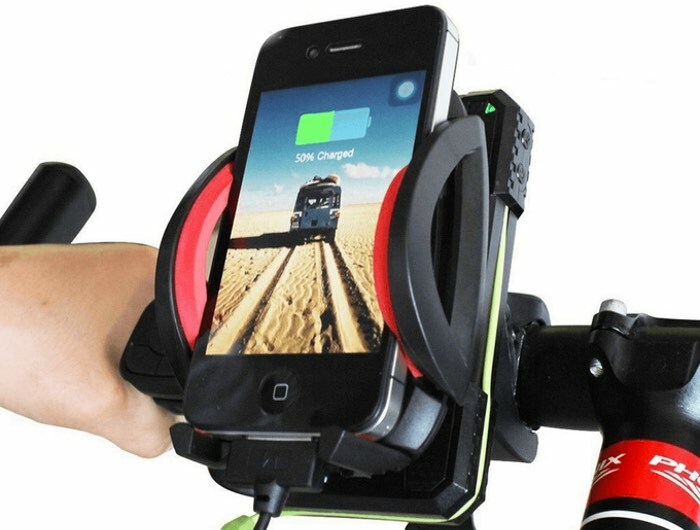 The BESEE Bike Lights supplies one charging line and 4 mobile connectors for iPhone 6/6s, iPhone 5, iPhone 4, micro use cable and mini USB cable. You really don’t have to worry: the BESEE Bike Light’s battery will not suddenly die off due to its robust built-in power bank functions. For more information on the new Besee light and smartphone bike holder jump over to the Kickstarter website for details and to make a pledge from £35.